Conway, New Hampshire is right at the gateway of New Hampshire's eastern White Mountains in the heart of the Mount Washington Valley. 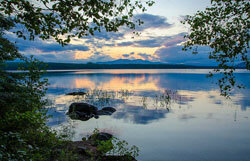 It's the home of beautiful Conway Lake, and runs from the Kancamagus Highway to the Maine border. Conway has several distinct sections including Conway Village which is right on Route 16 North prior to the North Conway outlet district. Center Conway is on Rt. 302 to the east. East Conway is along Rt. 113 North and runs to the farmlands of Fryeburg, ME. Some of the most scenic spots on the Saco River wind through the valley in the heart of Conway, with sandy beaches, mountain views, and clean water. It's a great place to enjoy swimming, canoeing, fishing, and wildlife. With its covered bridges, clean lakes and rivers, and mountain air, Conway is an exceptional place to live. Contact us for assistance buying Conway real estate. We are happy to help you find homes, condos and more. Updated: 20th April, 2019 8:59 PM.